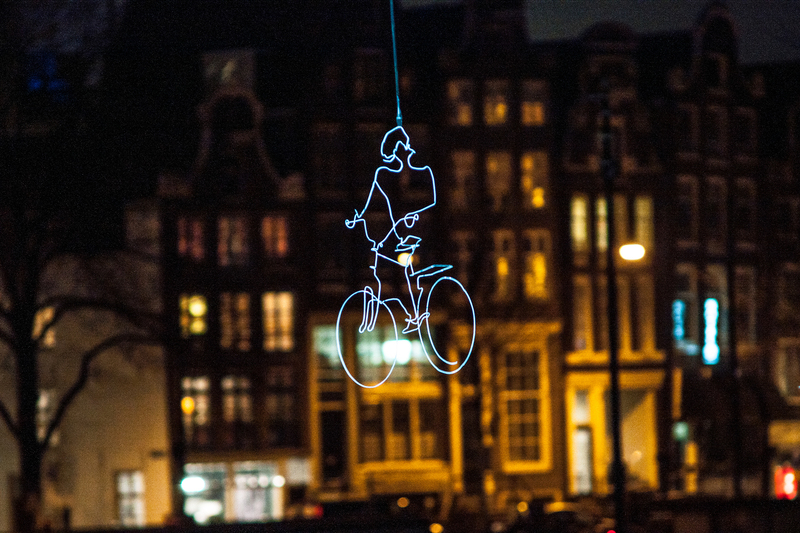 Crafted out of powder-coated stainless steel rods that have been hand-bent and welded into the shape of a house, replete with a nearby tree and passing cyclist, Drawn in Light is suspended over the water and lit on four sides by LED theatre lights. The house hangs in a mobile which allows it to slowly swirl around, mesmerizing the visitors. Ralf Westerhof is known for his 3D drawings that he creates using hand-curved iron wires. Westerhof finds inspiration for his kinetic art in the work of Austrian expressionist painter Egon Schiele (1890-1918). Westerhof's wiresculpturers look fragile but are quite sturdy.